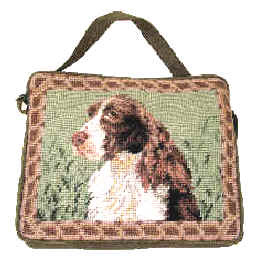 Needlepoint Dog Merchandise Accessories, such as Dog Handbags, Tote Bags, Cosmetic Cases, Shoulder Bags and Dog Eyeglass Cases! Dog Shoulder Bags, Dog Eyeglass & Cellphone Cases, Dog Cosmetic Cases, Dog Coin Purses, & Dog Breed Tote Bags! Dog Lover Gifts, such as Shoulder Bags, Purses, Cosmetic Cases, & Tote Bags! 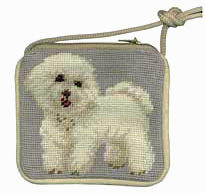 Select a Needlepoint Dog Accessory or Dog Gift From OVER SIXTY BREEDS!! 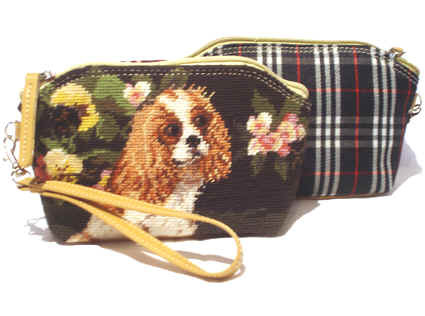 Browse our elegant selection of handcrafted needlepoint dog accessories, exquisitely detailed and adorned with your favorite dog breed. Among our gift items: Dog Eyeglass and Cellphone Cases, Dog Cosmetic Cases, Dog Shoulder Bags, Dog Coin Purses, Dog Handbags, and Dog Tote Bags! There's something for every taste and style. These needlepoint dog merchandise selections make fantastic gifts at Christmas or all year round!